We are proud to announce our fourth convention in 2018 for the european fans. 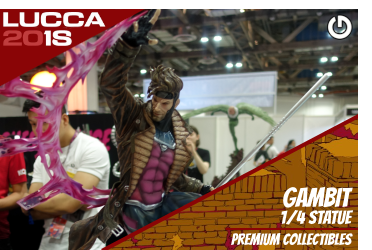 GHeroes as the XM Studios European Master Distributor together with Semic will be at the Lucca Comics & Games 2018 from October 31th to November 4th to present our statues to the european collectors. 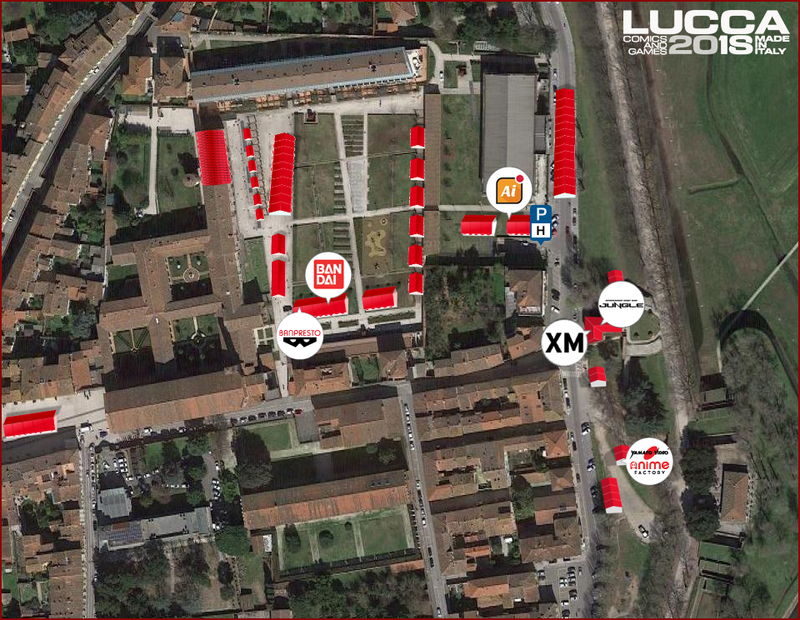 Lucca Comics & Games is the leading European festival dedicated to comics, games, movies and video games. Cross media show par excellence that since 1966 celebrates pop culture. With almost 500,000 visitors in total, over 40,000 square meters of exhibition space, 20 exhibitions, more than 500 events including meetings with authors and publishers, shows and concerts, is an unmissable event for fans of all the worlds of the possible. Lucca Comics & Games takes place in the historic center of the ancient city of Lucca, a delightful city full of art and history in the heart of Tuscany! The Lucca Comics & Games 2018 is an selected event. That means you can exclusive PreOrder the Event Exclusives statues with us in europe at this place. 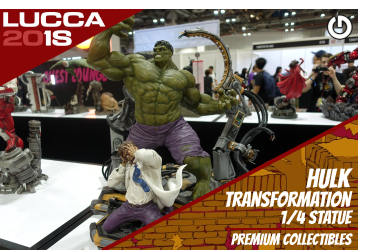 Be prepared to PreOrder the XM Hulk Transformation 1/4 Statue right here at Lucca 2018! The event is open from Wednesday, October 31th to Sunday, November 4th. We wish you all a lot of fun with us in italy. You are welcome here. A Event Exclusives statue is not available for a online PreOrder. They will not ship out to partner shops for sale to customers. The statue is only available at selected events or conventions from us. 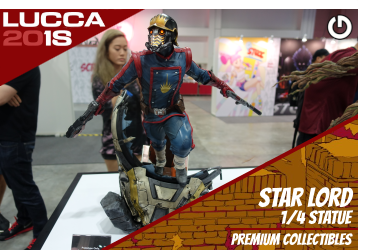 You can PreOrder the Event Exclusives statues here with us in europe at our booth at Jungle Palace in “La Casa del Boia”, welcome. 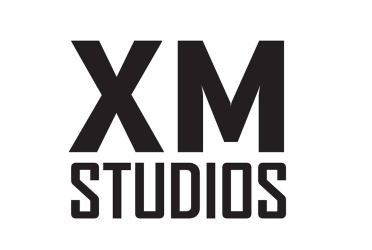 XM™ is an award-winning producer of hand crafted luxury art collectibles. Sourcing only the finest artisans, experienced sculptors, renowned painters with contributions from the most discerning collector communities, XM endeavours to create only the most outstanding original work of art. 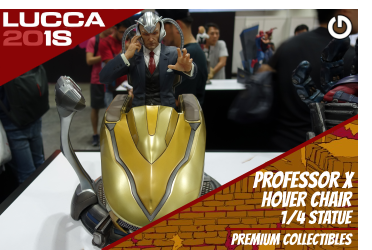 A Event Exclusives statue is not available for a online PreOrder. They will not ship out to partner shops for sale to customers. 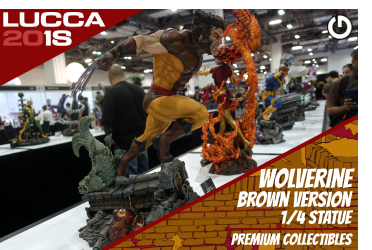 The statue is only available at selected events or conventions from us. 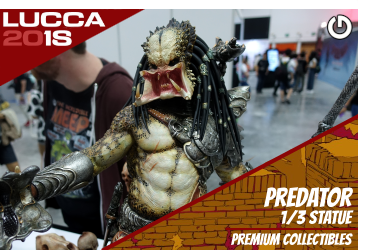 You can PreOrder the Event Exclusives statues exclusive here with us in europe at our booth at Jungle Palace in “La Casa del Boia”, welcome. With the fourth convention in 2018 we bring for our fans in italy on of the biggest booth we showed in europe. 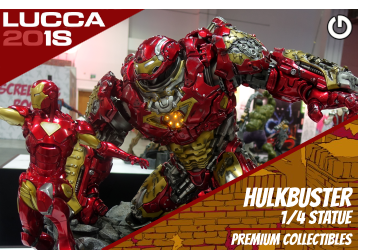 At Lucca Comics & Games 2018 you can see in person the Event Exclusive XM Hulk Transformation 1/4 Statue right on display at our GHeroes and Semic booth! 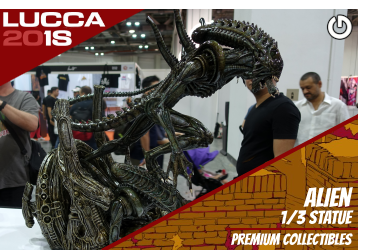 GHeroes and XM Studios will show you also from Narin the XM Predator 1/3 Statue and new XM Alien 1/3 Statue. 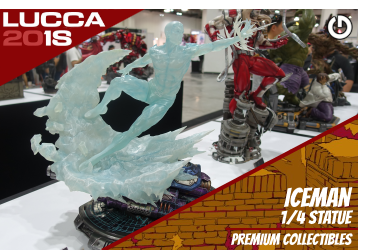 Another highlight will be at Lucca 2018 from XM Studios, the David Finch - XM Batman Sanity 1/6 Statue. A piece total of 12 characters and specially designed by David Finch in collaboration with XM Studios. Much more to see! 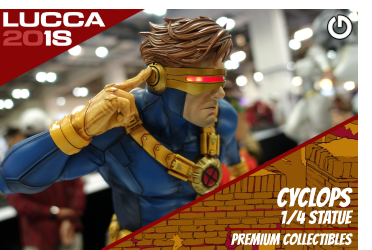 GHeroes and Semic will show you from Marvel an huge booth and we start with the X-Men! First the Exclusive XM Gambit 1/4 Statue. Old rivals and friends are the XM Professor X 1/4 Statue and XM Magneto White 1/4 Statue. The good guys showed up with XM Cyclops 1/4 Statue, XM Wolverine Brown 1/4 Statue, XM Weapon X 1/4 Statue, XM Storm 1/4 Statue and the cool XM Iceman 1/4 Statue. 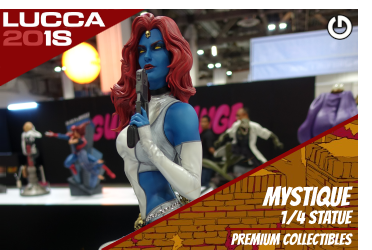 Two more villains with XM Mystique 1/4 Statue and the XM Omega Red 1/4 Statue. 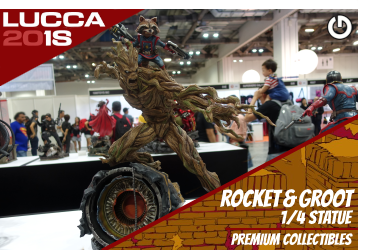 The Guardians of the Galaxy take place with XM Star Lord 1/4 Statue and the great XM Rocket & Groot 1/4 Statue. 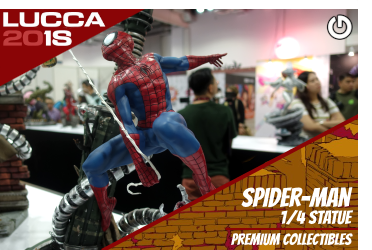 All time enemys on display, the XM Spider-Man 1/4 Statue in fight with XM Dr Octopus 1/4 Statue and XM Carnage 1/4 Statue. Our last piece is an Avenger, the XM Scarlet Witch 1/4 Statue. 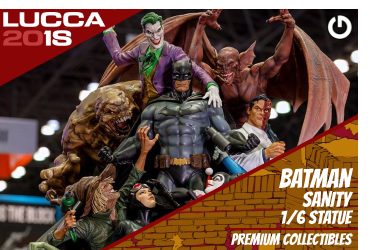 For DC Premium Collectibles and beside the David Finch - XM Batman Sanity 1/6 Statue there is many more on display from XM Studios. 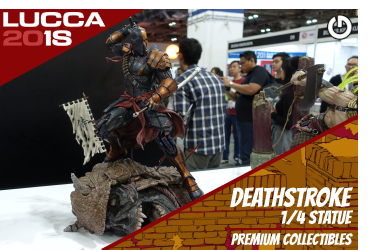 The unique "Knight of the Rising Sun" line comes with the Exclusive XM Deathstroke 1/4 Statue. Same line and a feisty female member of the Bat family, XM Batgirl 1/4 Statue. You need an big villain, here comes XM Bane 1/4 Statue for London. 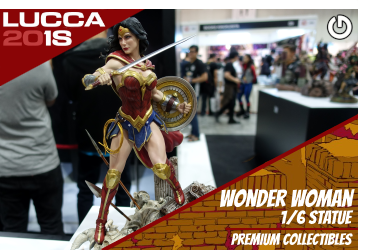 From the new DC 1/6 line you can take a look on the Justice League with the XM Wonder Woman 1/6 Statue, XM Superman 1/6 Statue, XM Aquaman 1/6 Statue, XM Flash 1/6 Statue and the villain XM Joker 1/6 Statue. We finish our presentation with the XM Red Power Ranger 1/4 Statue and present you the iconic team leader of the Mighty Morphin Power Rangers! The Ogre Bust from Takeya for the final. His favorite style is to combine two elements in a single figure. A masterpiece of a mixture of Japan’s origins, ‘Jomon’, and the newer civilization, ‘Yayoi’, evolved from people in areas of Asian countries. If you come to the Lucca Comics & Games 2018 this October you can expect more from us as just statues. We have three things to choose for our european fans at Lucca 2018. First an 'OG' XM Black Ceramic Cup, an high quality Supima Cotton 'OG' XM Black Shirt or an amazing artprint. High quality artwork from Studio HIVE done by Skan Srisuwan himself. The artprint from the XM Batman Samurai is waiting for you in an beautiful A3 size. 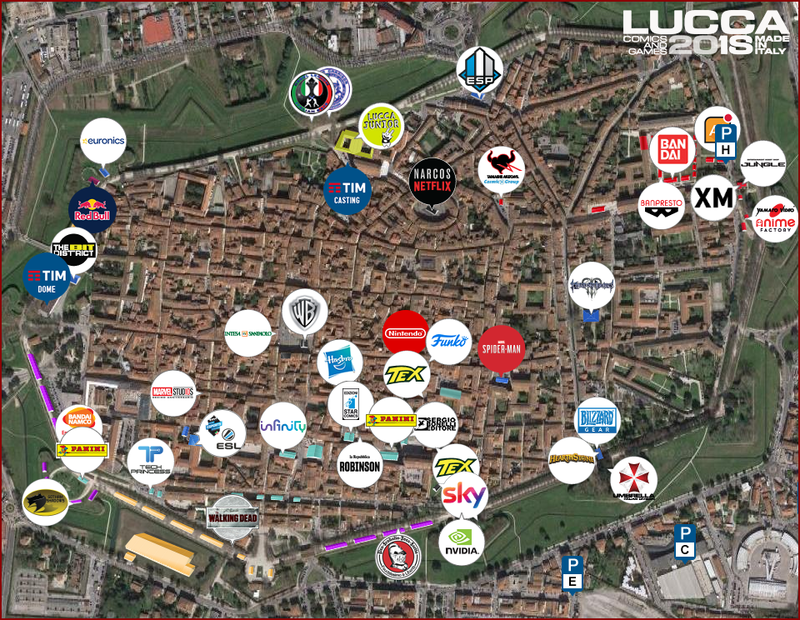 The distribution at Lucca 2018 will be the following. 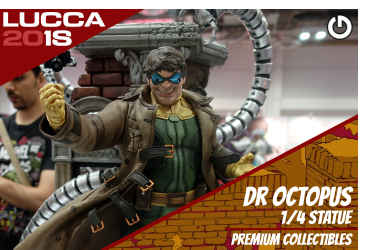 With an Purchase or PreOrder at Lucca 2018 you will receive one of the limited pieces. Note: The GHeroes logo is not on the artprint. 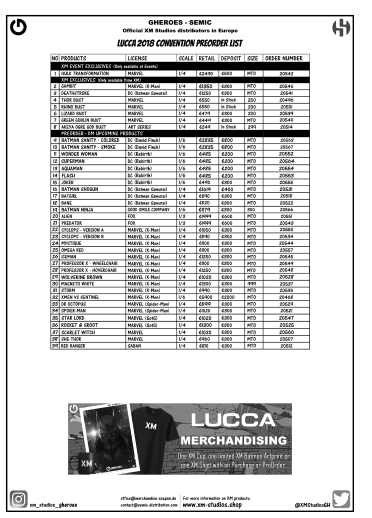 We like to present you the Lucca Comics & Games 2018 Convention PreOrder List, In Stock List and Order Form. 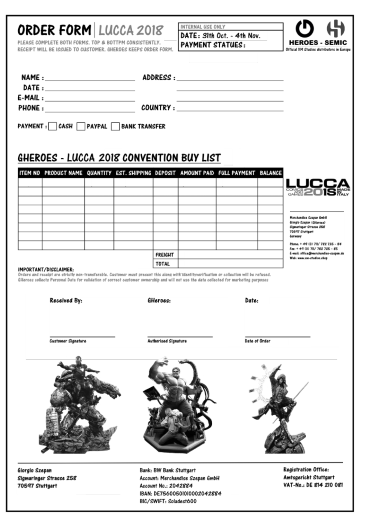 We will have all documents directly at our booth at Lucca. We'll see you at the convention! The Lucca Comics & Games 2018 from October 31th to November 4th will take place at the historic center of the ancient city of Lucca. It´s an big event with many indoor and outdoor booth, surrounded by other shows and more. 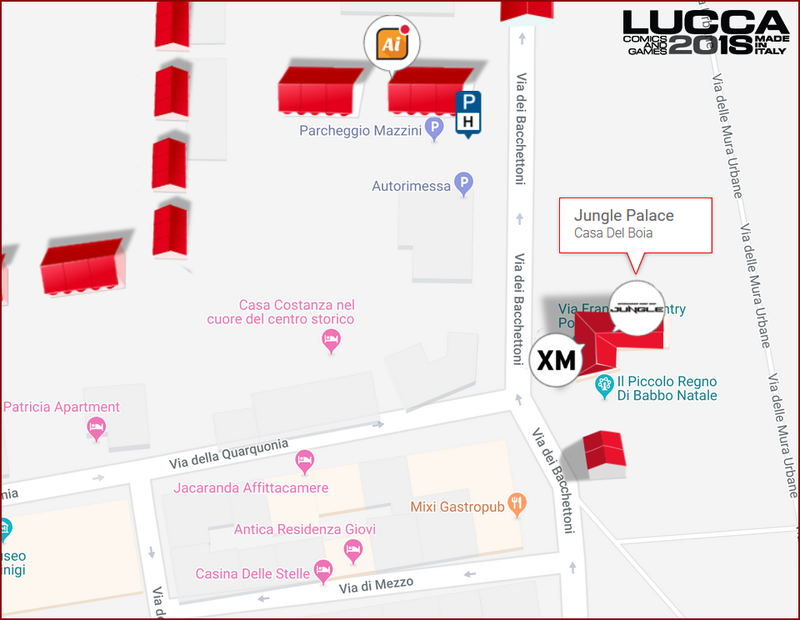 To find our booth on the "Via deia Bacchettoni" street at Lucca we have for you a Overview Map which shows our place at Jungle Palace in “La Casa del Boia". Visit us at the Lucca Comics & Games, you are welcome!